Steven: Steve and Jill here. Steven: Welcome to the Land Investor’s Show, entertaining land investment talk. I’m Steven Jack Butala. Jill: And, I am Jill Kristine DeWit, podcasting from sunny Southern California. Had to throw in there. Steven: Like the killer car. Today Jill and I talk about when to put a mobile home on your land and when not to. Jill: I know you’re going to have some good ideas about this. Steven: I have multiple stories, multiple beautiful stories with happy Hollywood endings about mobile homes on land. Jill: I bet 99.9 to 100 percent of the time, it’s never a bad thing. It’s just, depending on your budget, your market, and all that kind of stuff. Jill: It’s going to get my attention. Jill: They figured it out. Steven: “Somebody had a ‘Little House on the Prairie’ moment.” It’s not hard to make that jump. Steven: Before we get into that, though, let’s take a question posted by one of our members on the landinvestors.com online community; it’s free. You know, it’s funny, I saw this question the other day, and I weighed in on it. Steven: Oh, good. They can answer it on the air, then. Jill: I actually put a note in there, because I was like, “Hey, good for you for thinking of it and checking it ahead of time because usually, what happens is, you learn about these after you good one up.” After, you realize, “Oh no, I just bought and sold a property that had an HOA on it and it had $800 in back fees.” That’s usually how it goes, unfortunately. And, you go, “Well, I will always check that.” So, sometimes, it’s a little tricky because it’s not on the deed; it doesn’t smack you in the face. Jill: Right. That there could be an HOA and you need to dig a little further. And, you could put in the name of that and do some internet searching, and nine times out of ten, you will find it. Steven: That was my suggestion. Jill: And then, the third one is, ask the county. Steven: Yeah. That’s what I do. Jill: Because, they communicate back and forth because, if there’s an HOA there and it’s a pretty solid HOA, they communicate with the country because, if people don’t the fees, then they’re working with the county because they’re going to put lanes on the property and they’re going to try to take the land back. And so, the county is aware of that and aware of them. Jill: Oh my God. Hilarious. Steven: There’s two types in this privately owned land in this country; there’s un-subdivided land and subdivided land. And, when you look at a legal description, you can immediately tell. Jill just said, “Glenn Oaks Lot,” whatever; that’s been subdivided and that’s where there’s HOA’s. If you have the North-East quarter of South-East quarter of the Western half of section 17, township 12, range 13, East, that has not been subdivided; it’s been cut up or split up, and there’s a ridiculously high chance that there’s no HOA involved at all. The county will tell you right because the counties, by the way, and HOA people really don’t like each other. Steven: They have a lot to say about each other. [inaudible 00:04:32]. Jill: Totally, totally. That’s kind of funny. Love it. Steven: Today’s topic, when should you put a mobile home on your land and when shouldn’t you? This is the meat of the show. I’ll answer that question briefly, and then, we’ll take 15 minutes to talk about it. Jill: Then, we’ll take Jill’s questions, then we’ll open the lines and take Jill’s questions, is what it sounds like. Steven: Wouldn’t it be fun? I’d love [crosstalk 00:04:58]. Steven: Can you guys stop it? Steven: You should always put a mobile home, if you have the opportunity, on your land, and if it’s allowed. That’s the short answer. Anything you can do, anything that you can dream up, if you buy a used shack on CraigsList and put it on your land or have somebody else put it on your land, and take a picture of it, it completely and totally changes the way that it’s perceived. It’s not, now, just perceived as every other piece of vacant land on the real estate, on the internet. It gets those juices flowing for the people who just want to change their life. We sell a lot of land to people and users who are fed up with paying mortgage, or working for the man, or whatnot, and they have this fantasy in their head about getting out of it and going to live somewhere else where it’s just peace and quiet, connecting to the internet, and collecting rainwater, and putting in alternative water-sewer system, and everything else, and electricity, which is becoming more and more and more prevalent. Jill: And, like, easy. It’s really easy, nowadays. Jill: I don’t know if you have to do burned-out. Do we really have to do a burned-out, old one? How about we have one that’s just kind of basic? Steven: That’s fine. Or, old. I only say, “burned-out,” because burned-out mobile homes. Here’s the other thing, there’s one subdivision specifically, in Coconino County, Arizona, that we purchase a lot of property in, and for whatever reason, there’s a bunch of people that made that dream I just described a reality. And so, we have inadvertently purchased properties, not knowingly, where there’s mobile homes there. Some are burned-out, some are just really old, but all of them are a mess; they’re vacant and most of them are pretty seriously vandalized. But, I’ll tell you what, we don’t own them for very long. The other point is, whoever lived there before you, if there is a vacant property on there or any type of property, they figured all this out; they figured electricity out. It may be the “Little House on the Prairie” version, with the five-gallon bucket and whatnot, but they still figured it out. There’s still a lot of steps head from just a vacant piece of property. Plus, there’s a pretty darn good chance you can get to it, and not get to it, and get out of [inaudible 00:07:31]. Jill: That’s a good point. Obviously, they got in and they got out to get the mobile in there. I appreciate that. I was going to say, it’s interesting is, not having a mobile on there, but just having … I get so darn excited when we have sellers contacting us back from our offers, and it’s mobile-zoned mobile. We cannot keep those in inventory. They fly off the shelves. It’s amazing how much people want those lots. So, they know. Steven: I hold a consulting call on Thursday for our members who want to pay. Steven: Can you imagine? If you had ten consulting questions for me, what would you ask? Can’t even think of it, can you? Jill: No. I mean, I was … No, go ahead. Steven: Because, I have a bunch for you. Jill: Mine were all kind of funny. Jill: Alright, you want to hear? So, I’m Joe New-member. I get a free consulting call with you. Jack, how fast can I be like you? Steven: Oh, yeah. So, I would shut that down. And, I’d be real straight. I just had this conversation, yesterday. Jill: That’s a common one, yeah. Steven: Yesterday, I had this exact conversation with a guy who’s my age, who’s frustrated with his job, and he didn’t come out and say it like that, but he said, and I said, flat-out, “If that’s going to be how you’re going to look at this, then you’re going to be wasting your time and your money right now. This is not something you power through just to get to the other side like, let’s say, history class. This is a massive lifestyle change that could make you and does make many people wealthy beyond their dreams, literally.” This is not a sales pitch. So, would you rather have somebody wash your car and have them take 45 minutes or 20 minutes? I vote 45. Jill: Okay, then I have a followup question, then. Steven: And, I’m not avoiding the question. It’s going to take as long as it takes you. Jill: Alright. What do I need to expect? I work a day-job. I have a family. Steven: This is what you need to expect. These are good questions, Jill. Steven: Totally off-topic, but anyway, we’ll get back to the mobiles in a second. You can expect, however organized you are by your life right now, you’re going to increase that times four, at least, maybe times ten. Jill: Why rough? I have you and I have all the answers, don’t I? Steven: We make this sound easy and fun, and it is easy and fun, but it’s also a lot of work, is what I mean. Steven: I don’t mean it’s, like, difficult. Jill: Got it. Now, don’t expect a divorce. If you do, you’re doing it wrong. Jill: Or, the divorce was imminent anyway. Steven: No. I’m trying to answer the question. Steven: Why are you bringing up divorce? Jill: I just thought it was funny. Never mind, go ahead. Steven: What was it? Let me laugh with you. What did you say? Jill: I was kind of trying to lighten it up, but I was saying, “Expect a rough road.” Well, don’t get divorced over it, because if you do, you’re doing it wrong. Steven: I mean, if you’re going to get divorced over trying to change your life, and improve your quality of life and how much money you many, and quit your job, and all that, then you should get divorced anyway. Jill: That’s what I said, that it was imminent anyway. I’m kidding. Steven: Your spouse should be your cheerleader. If they’re smart, they’ll get right in there with you. Jill: So, okay. Can I have one last question, and then, we’ll get back to this show? Jill: So, my one last question, I’m Joe New-investor, what’s different about this versus trying to go get a real-estate license or trying to … I watch HGTV all the time. What’s better about this? Look, my sister, my little sister, I had her on the show about a month ago, is the top 1% of all the real-estate agents in the country. She’s top-producing, 1%. And, in commissions … She’s also a pretty avid investor; she owns, I don’t, 30 or 40 houses that she and her husband rent out and do very well with, but excluding that, just the real-estate commissions piece. And, she hustles, she works harder than both of us combined. Well, maybe not you, but me, for sure. And, she makes like 120 grand in commissions, and she’s at the top of the commission bracket in the whole thing. So, if you want to make $120,000 and work, I don’t know, 10 hours a day, 7 days a week, being a real-estate agent’s for you. If you want to make half a million bucks a month a year from now, trading land and having a nice, casual, fun life, that’s what we’re setting up here. There are people in our group that make a million dollars a month, more than a million a month. Steven: I have a question. Steven: Can I interview you? Steven: It amazes me and fills me with pride to hear you talk with land sellers. And, I know that you have no idea, when that phone rings, what you’re going to get. And, it just baffles me because it annoys the hell out of me for me to do it; I’m not set up for it. What’s the trick? Are you just born with it? What’s the attitude adjustment that you go through when that phone rings? And, you look at it, you look at the caller ID, and you know it’s a seller because all of our stuff’s separate. You know the land, we have a different landline and a different houseline. What’s the process you go through? Do you go through an actor type process and become Jill Kristine DeWit? Jill: No. No, actually, I’m sincerely excited because you never know what’s coming at you, and it excites me. I’m like, “Oh, this is going to be good. Maybe this is on that … We just sent out a bunch a mail on 20 acres in this area. I hope this is one of those people.” I’m like all excited, you know? So, I have that in the back of my head. You never know what it’s going to be. And, I don’t get hung up on this stuff anymore. You know, it’s funny, I realized, you and I used to talk about the hate a lot and when people call back because they’re not happy, right? And, I’m like, “Why is this such a big deal?” And then, I realize, “You know what?” I thought, maybe I just get the better calls, maybe I haven’t been on the phone enough recently. I don’t know. And, I realized, nope, it’s none of that. I just think it’s me and my attitude. Steven: That’s what I think. Steven: Really cracks me up that people get so upset about getting an offer on their piece of property. It cracks me up. Jill: Exactly. Do you yell at the same person who leaves a pizza coupon hanging on your doorknob? Steven: Probably. You know what, I bet they do. Jill: That’s right. That’d be hilarious. Jill: Oh my God. Yeah, good luck. Are they still around? Steven: I don’t know. Are you 80? Jill: [crosstalk 00:16:12]. Someone asked me about something about, “Well, we’re ranked A+ by the Better Business Bureau.” Then, you’re like, “Huh.” Kids don’t even know what that is. Steven: I know. And, that’s why kids are smart. Jill: Alright. So, back to the mobiles. My thought was, when to put a mobile on. I said, my the market demands. I don’t know. Some lots, some mobile lots sell awesome anyway. Jill: How much is it? Do you know? Steven: It’s not cheap. It’s not cheap at all, especially if you’re going get solid hookups. But, the guy that owns that company, he knows where to get free mobile homes, and if you just call him. And then, if you say, “Look, I bought 14 properties in this subdivision up in XYZ and I need 14 mobile homes. I need the free kind. And, I don’t need to have them connected to anything; I’m just going to do a photo-shoot,” those are the kinds of deals they love because they can just literally dump them off the trailer and put the anywhere. So, make friends with those guys. Jill: Are you alluding to the thing that you’re working on for, maybe, next year? Jill: Because, that’s a whole separate thing which is awesome. Steven: Yes. I am alluding to that. I’m building up to that. 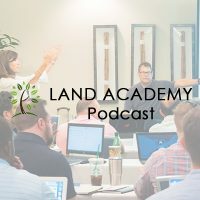 It’s this: I had a member call with a guy whose been a Land Academy member for one of the original guys, and he paid for a consulting call, and he said, “I’m calling to thank you. I don’t really need any advice.” And, we talked for like 45 minutes. And, he said, he’s parlayed this land-model that we have and tailored it to what he’s been doing for a while, and it’s this: you buy a property, you send letters out to, like you said, mobile home-zoned property only, deeded pads and deeded areas for mobile homes and mobile home parks. And, you literally try to attract the people who have a burned-out mobile home or a mobile home that’s been installed prior to, I think he said, 1978. He does it in a very specific state, which I’m not going to mention. All states have different regs, and if you look on the internet, it’s really easy to find the regs, regulations. They’re grandfathered in. So, what he does is he buys a mobile home, the pad that the mobile home’s on, removes the old one, and puts in a brand spanking new one on and connects it all up. And so, now, he’s usually into it for maybe $10,000, the whole thing. And, the new mobile home costs whatever they cost, 40, 50, 80, 100,000 dollars, and puts it and doubles his money. He sells it for 200, or 180, or whatever the market demands. And, he’s absolutely killing it. He told me a good story. He said, the original investors thought he was nuts, the people that were backing him. And so, he’s since gone back to those guys and said, “See what you missed out on?” I love that. Steven: So, after we release House Academy, I’m kicking around the idea of doing Mobile Academy, and it will outline exactly all the 50 states, the regs to do it, where to do it, and in great, incredible detail. Steven: So now, you’re talking about a real-estate deal where you’re making 80 to 100,000 dollars every single time. It’s not hard to imagine doing eight to ten deals a month like that. And, you’re talking about making a million bucks a month, like we were talking about earlier. Steven: That what you can expect, to answer your question. Steven: Jill’s falling asleep, almost literally falling asleep. Steven: Not to be entertained; they actually want real-estate information. Jill: Well, that’s what I’m doing. That’s what I’m doing. Steven: You’re not. You’re mesmerized? Steven: Oh my God. Princess Jill Kristine DeWit. Steven: Well, you’ve done it again, according to Jill, wasted another 20 minutes listening to the Land Investor’s Show. Join us tomorrow for another interesting episode where we discuss how to make your land standout on the internet, let’s say, other than putting a mobile home on it. Jill: Cool. And, we answered your question, should you have one, posted on landinvestors.com, our online community. Go there, it’s free. Steven: You are not alone in your real-estate ambition. Jill: I wasn’t falling asleep. Steven: I know. Yeah, you were a little bit. Jill: Well, I just was kind of listening. I’m just deep in thought, that’s all. Steven: Sometimes, we have good advice, you know? Jill: I think we mostly have good advice, at least I hope so. I’m really trying to walk around and help people, and I know you are too. Steven: The fact is this, you know this, the number of people who listen to the show goes up pretty dramatically every month, so either … I don’t know why. It’s probably not anything we’re doing. Jill: It’s silly. I think it’s good. Hey, share the fun by subscribing on iTunes or wherever you’re listening. And, while you’re at it, please rate us there. Steven: We are Steve and Jill. Steven: To buy undervalued property.